Update 8:55 p.m. – New video added. 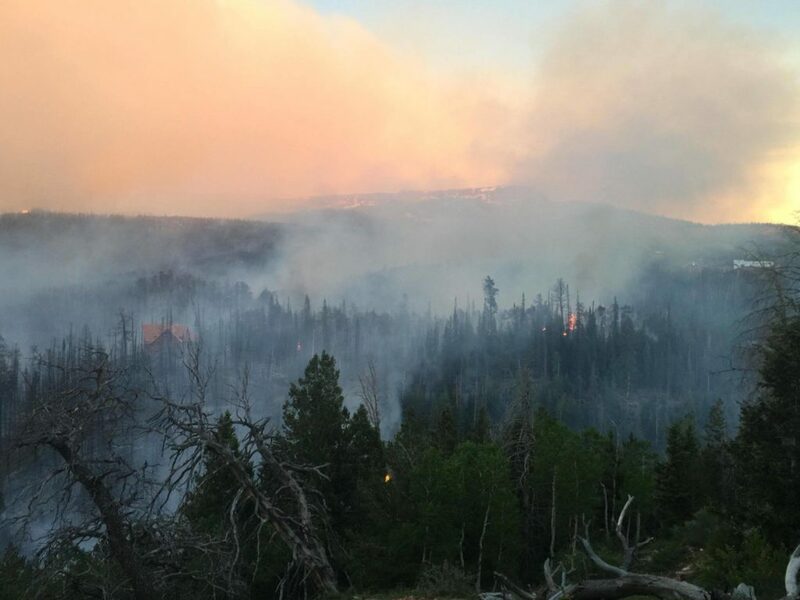 Update 8:40 p.m. – Additional information from the Color Country Fire Interagency added. 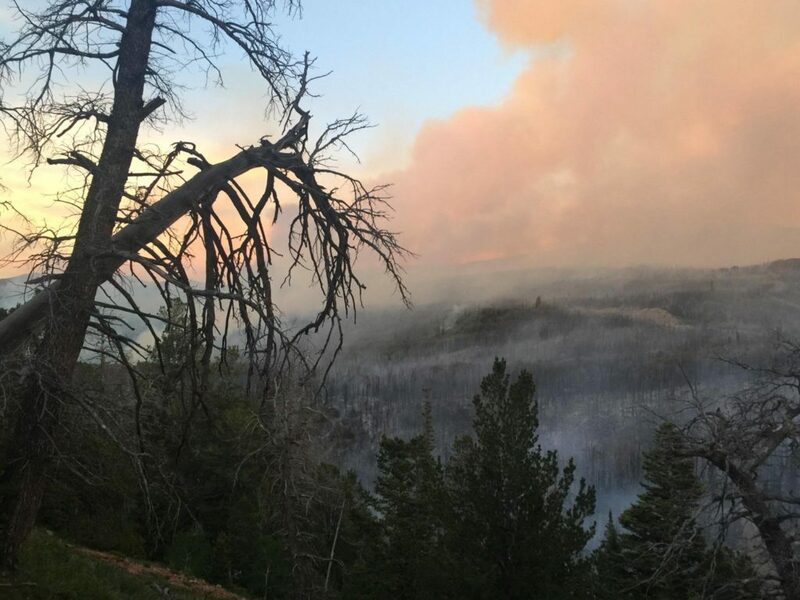 Update 8:30 p.m. – Fire grows to 500 acres. Update 7:50 p.m. – Comments from Dave Hamill, Andre Aguler and Teresa Hansen added. Update 6:24 p.m. – Comments from Rondo Harrison added. 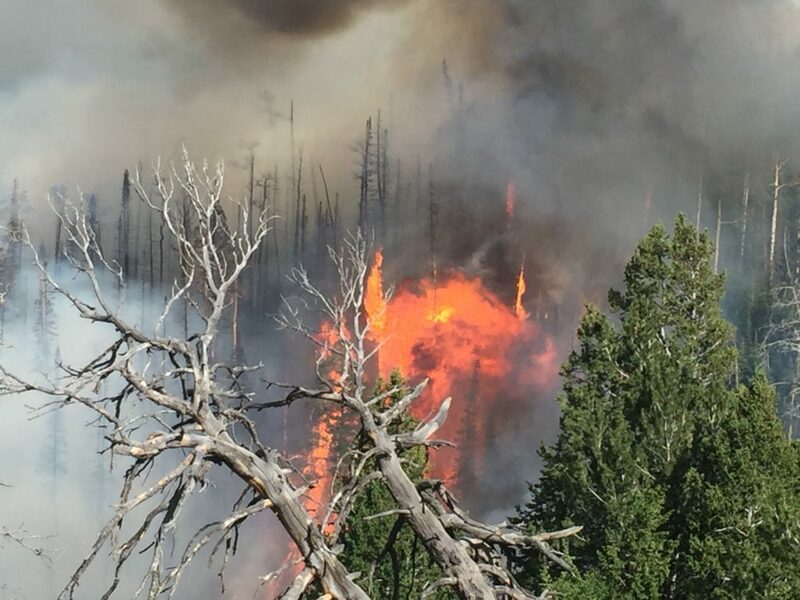 Update 4:49 p.m. – New details and photos added. Update 4 p.m. – New video added top of the story. 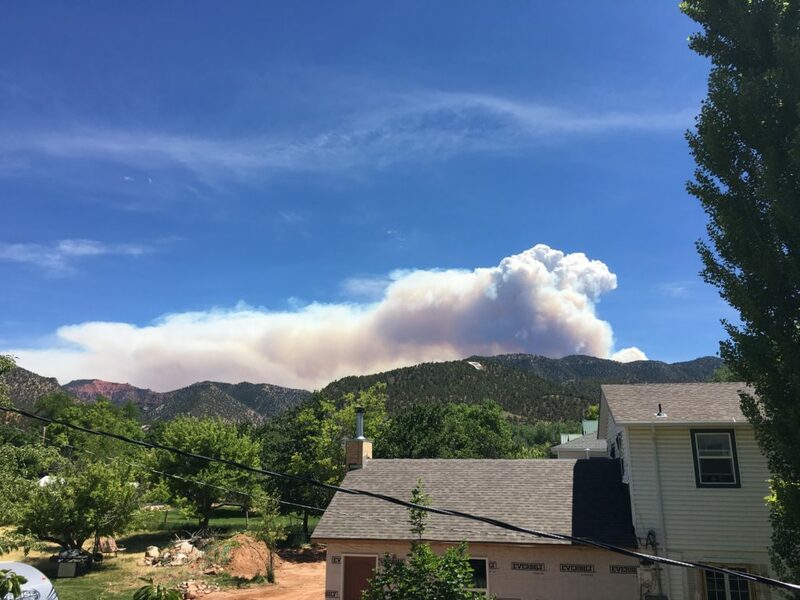 Update 3:48 p.m. – Comments from Scott Young added. Update 3:40 p.m. – Photos added. 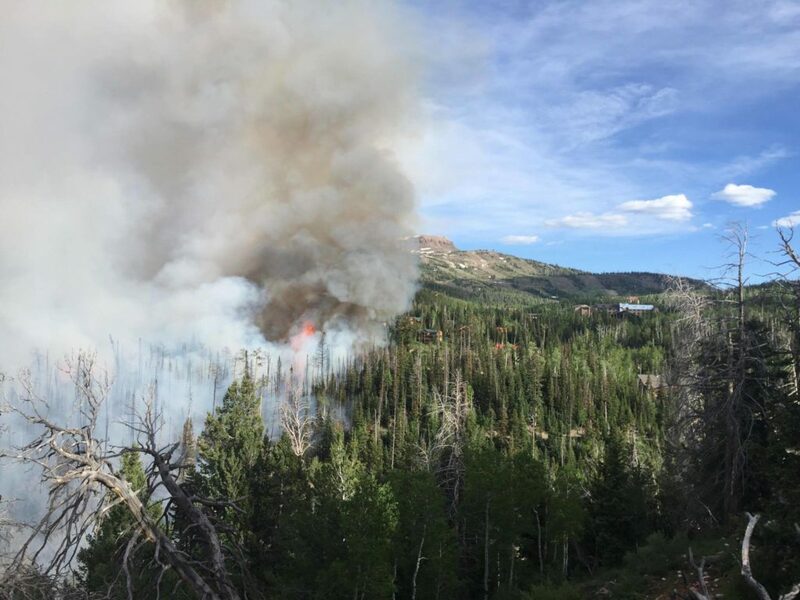 Update 3:02 p.m. – Fire believed to be human-caused. 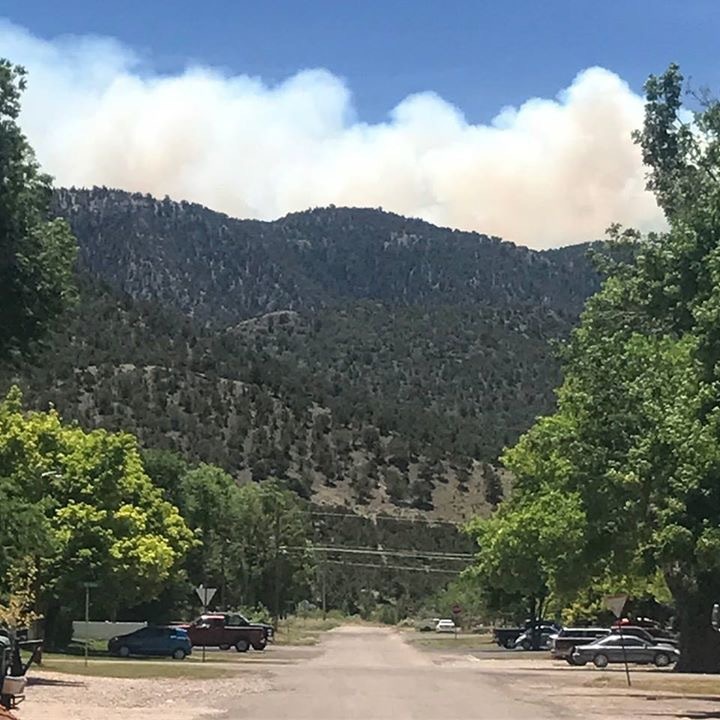 BRIAN HEAD – The town of Brian Head has been evacuated due to a wildfire that ignited near the town Saturday afternoon. 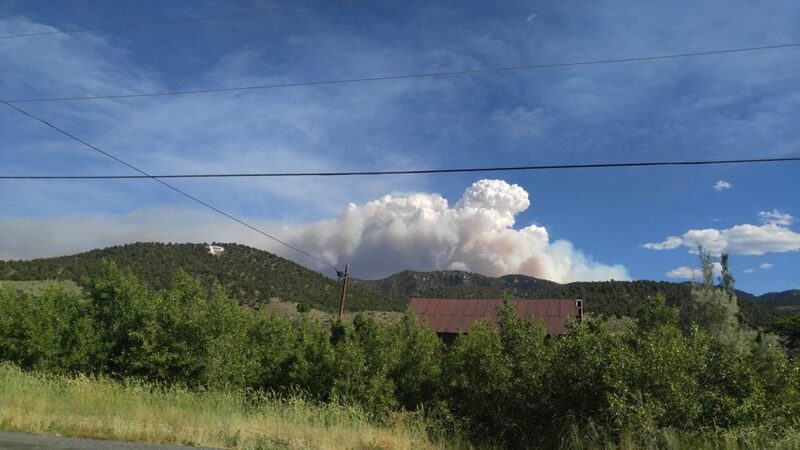 State Route 143, which goes from Parowan to Brian Head, has also been closed. 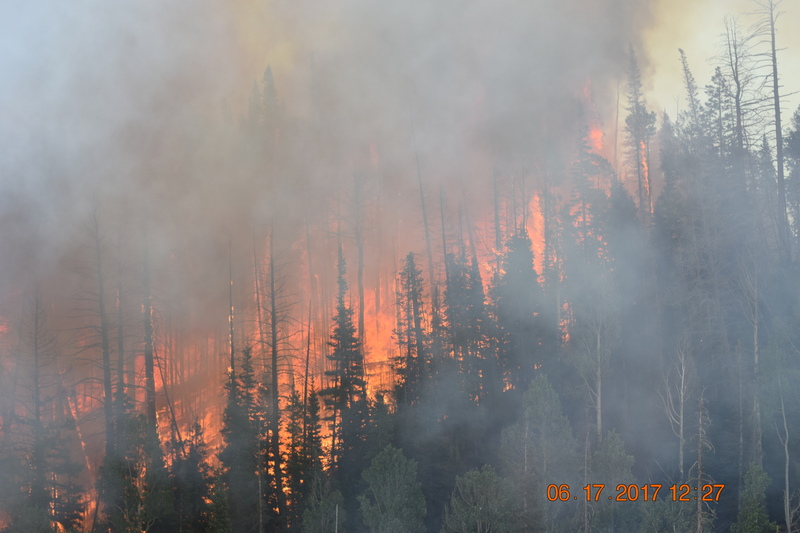 See St. George News videos at the top of this report and at the top of the photo gallery below. 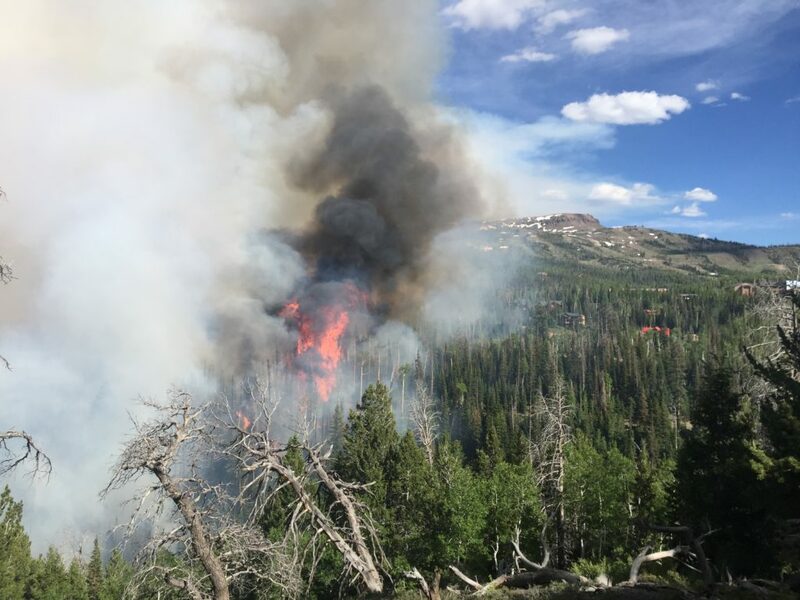 The Brian Head Fire was reported around 12:20 p.m. Saturday and has resulted in the evacuation of 750 residents and visitors from the resort town. 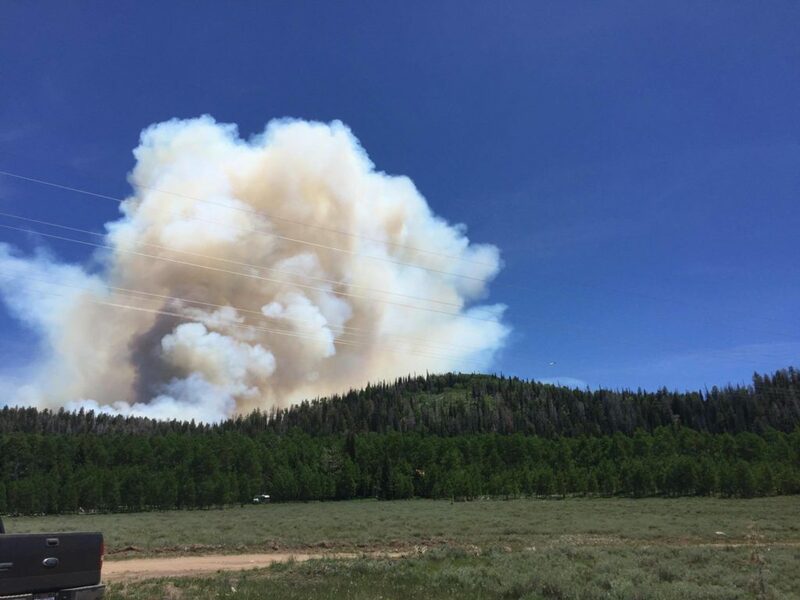 The fire has grown to an estimated 500-plus acres as of 8 p.m, according to an update from the Brian Head town website and the Color Country Interagency Fire Center. 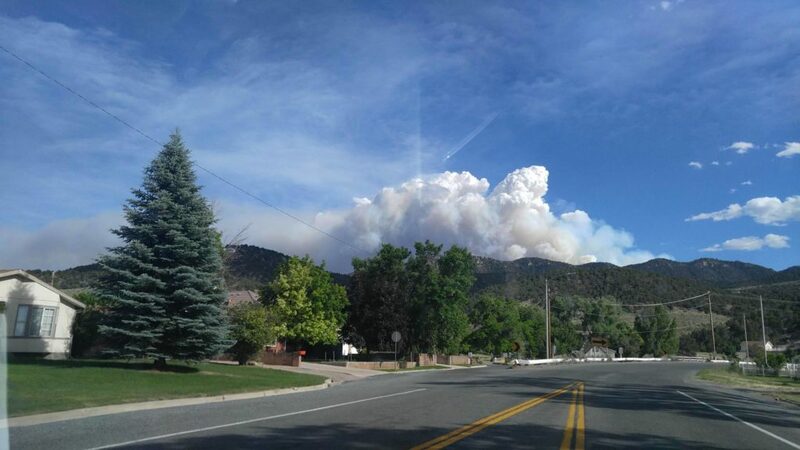 The fire continues to approach the town from the northeast. One home was confirmed to be lost to the fire while another was severely damaged. 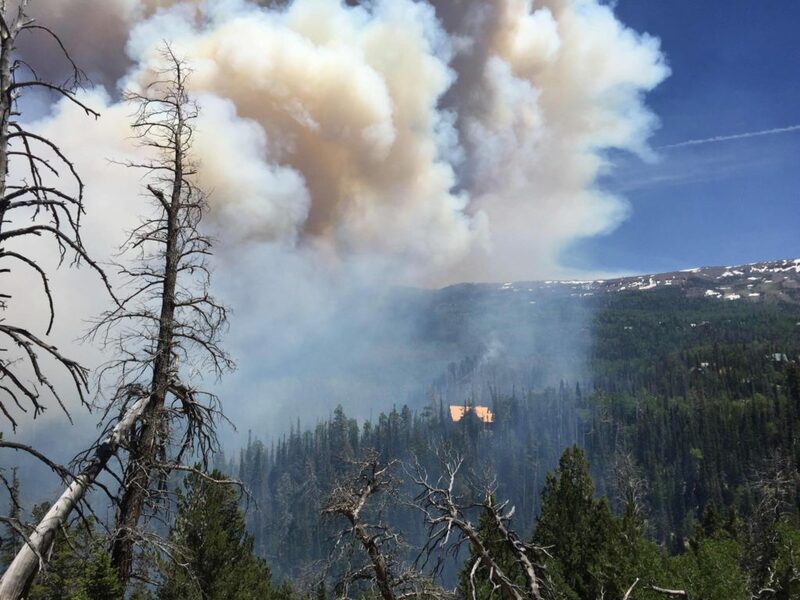 The town and the structures within it remain under threat as the fire has reached into the town limits. 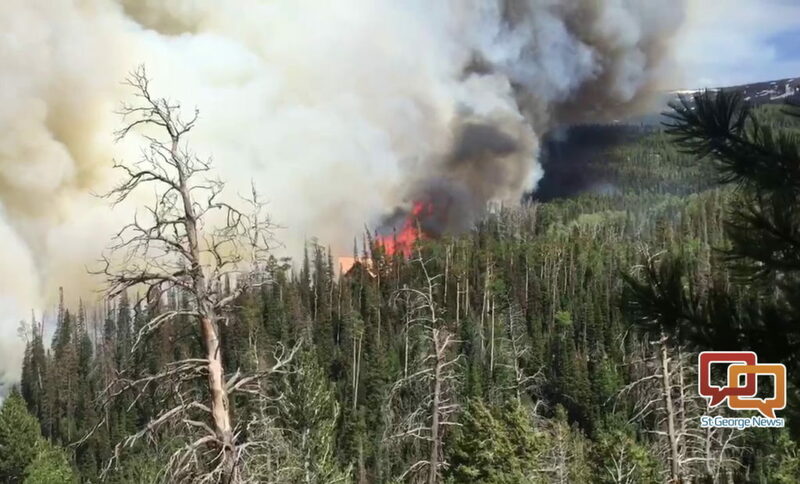 Critical watershed in the area is also threatened by the fire. 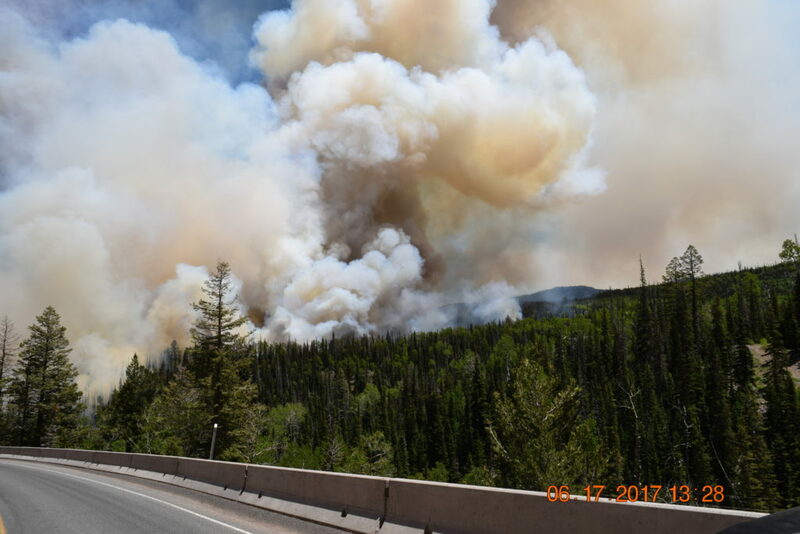 Highway 143 is closed from Second Left Hand Canyon to the junction of Highway 148 near Cedar Breaks National Monument. 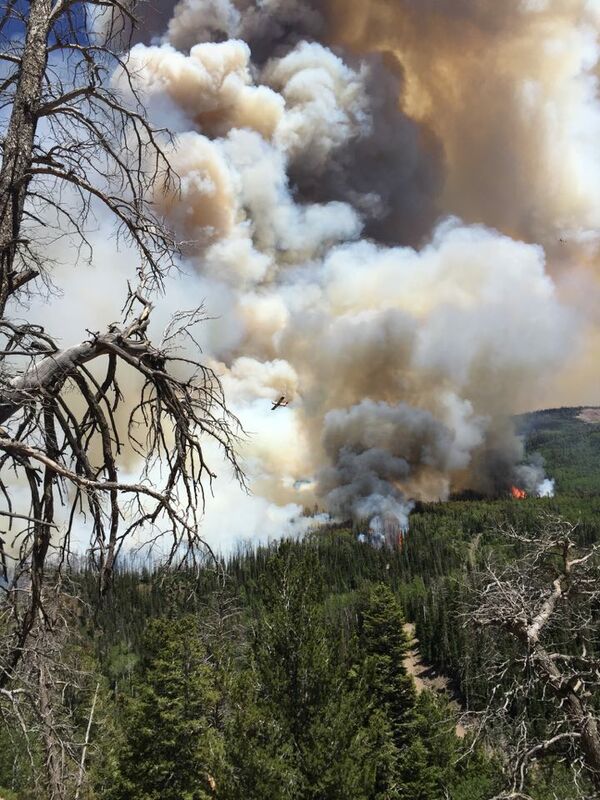 The fire is continuing to show active behavior, including crowning, spotting and torching. 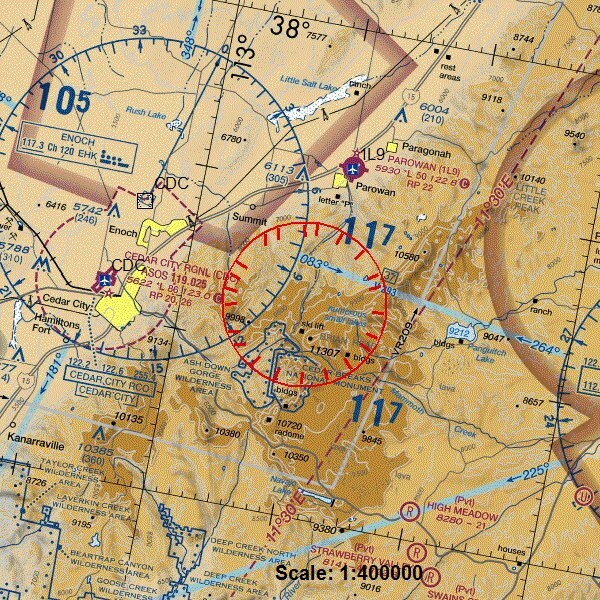 Helicopters and planes are dropping fire retardant near the fire perimeter to slow its progression. Record-challenging heat is expected in the coming days and will continue to challenge suppression efforts. 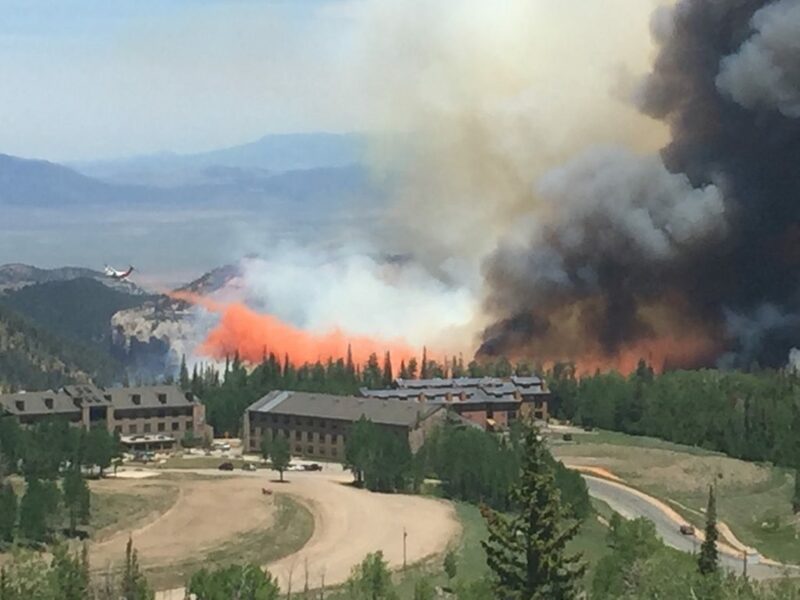 The fire is being managed by a Color Country Type 3 Incident Management Team. 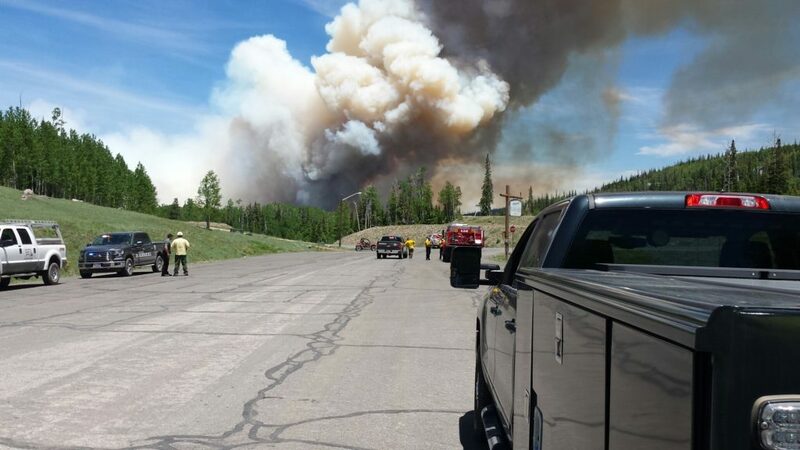 A total of 115 personnel are assigned to the fire, including engines from multiple agencies. 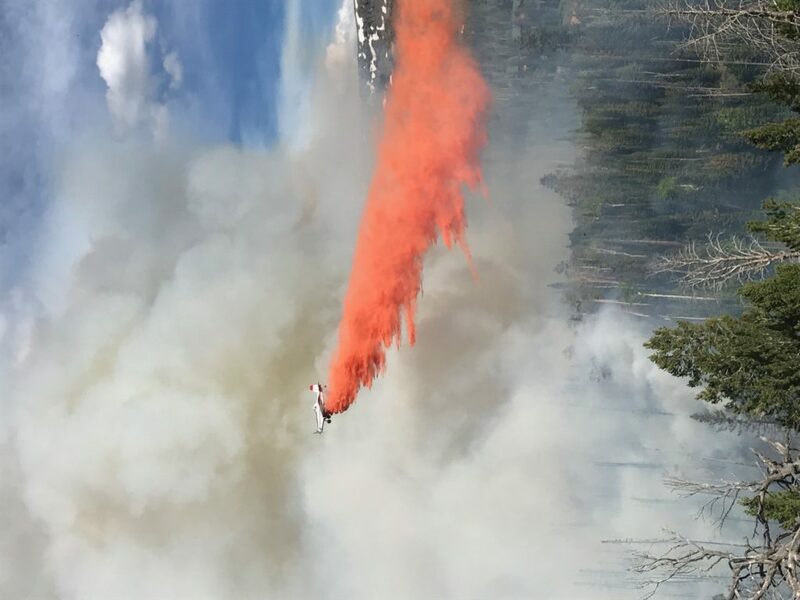 Air attack resources include one Type 3 helicopter, two Type 2 helicopters, four Type 1 air tankers, one VLAT (Very Large Air Tanker), six SEATs (Single Engine Air Tankers), planes and multiple overhead. 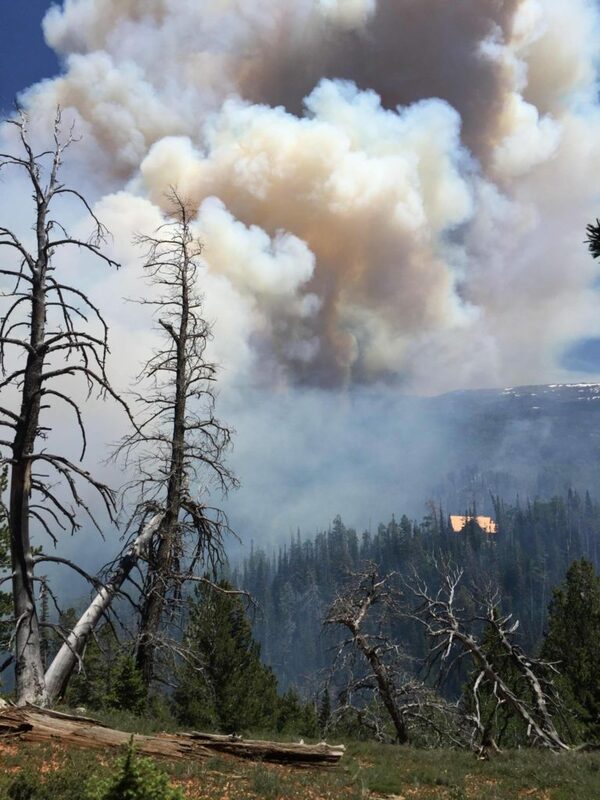 A Great Basin Type 2 Incident Management Team is on order and expected Sunday evening or Monday morning. Fire managers have determined the fire is human-caused and the investigation is ongoing. 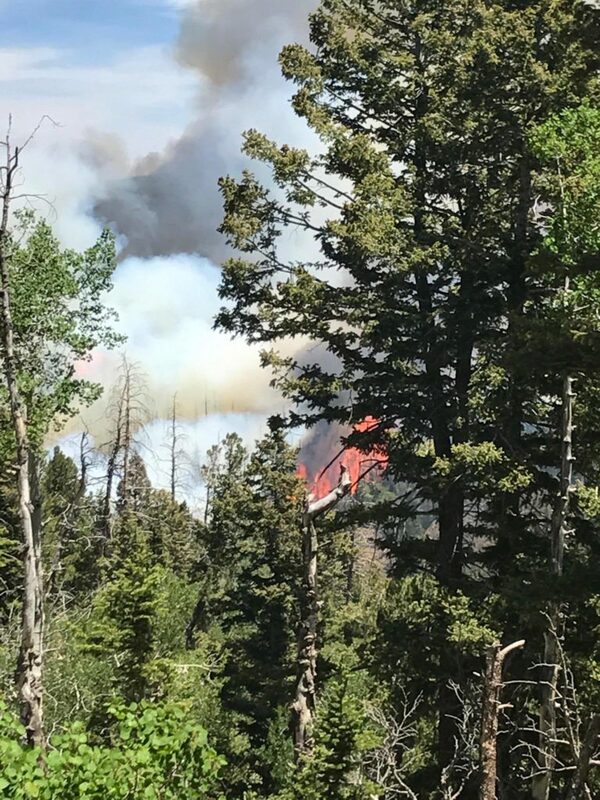 Dave Hamill of St. George was at Brian Head when the fire ignited and said that, as of 7 p.m., he’s watched a few cabins go up in flames. 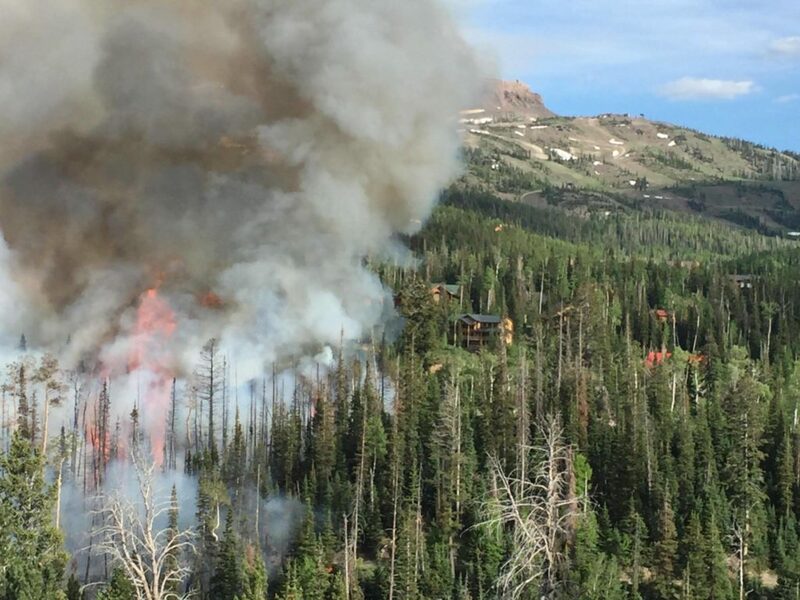 “We’ve seen several cabins burn down; structures lost over all the mountain,” Hamill said; fire officials confirmed only one home lost and another damaged in its 8 p.m. information update. 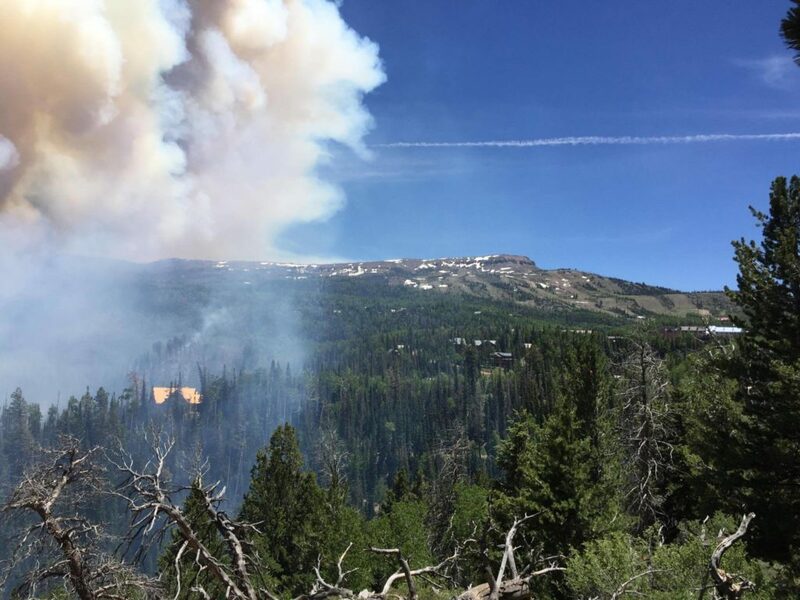 Brian Head resident Andre Agulier said he’s been coming to the area for for five years and has never seen a fire like the one on the town’s doorstep. He also said it was sad someone was potentially careless and started the fire. 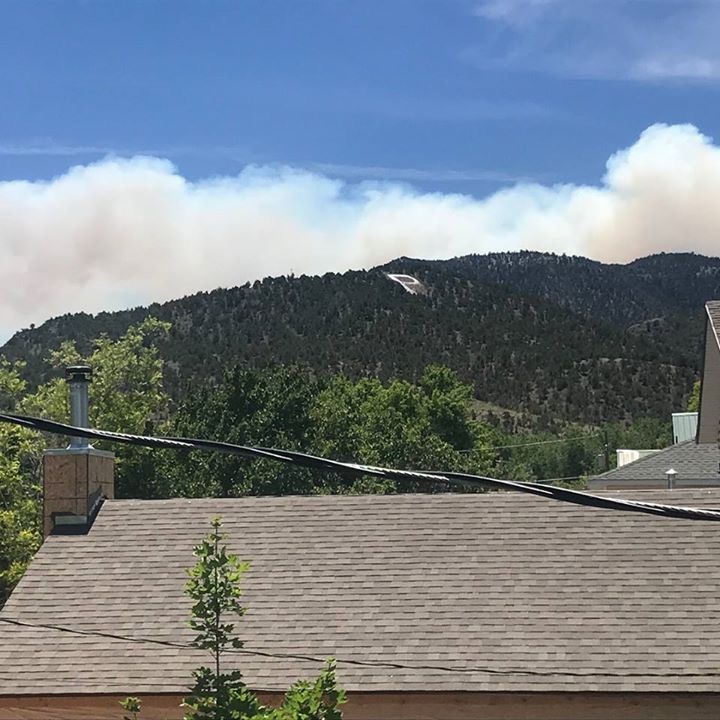 The couple went into town and to a supermarket where others had gathered and were told the fire had started “in the switchbacks” at someone’s cabin. The Hansens then drove to a lookout to see how bad the fire was getting. “It was getting bad and made us nervous,” she said. They returned to the cabin and figured they should start packing some things into their car. Hansen’s husband went back into town first, and by that time, people were being told to evacuate over loud speakers. He returned to the cabin where they started packing. They ultimately left when the town marshals told everyone in the area to evacuate. 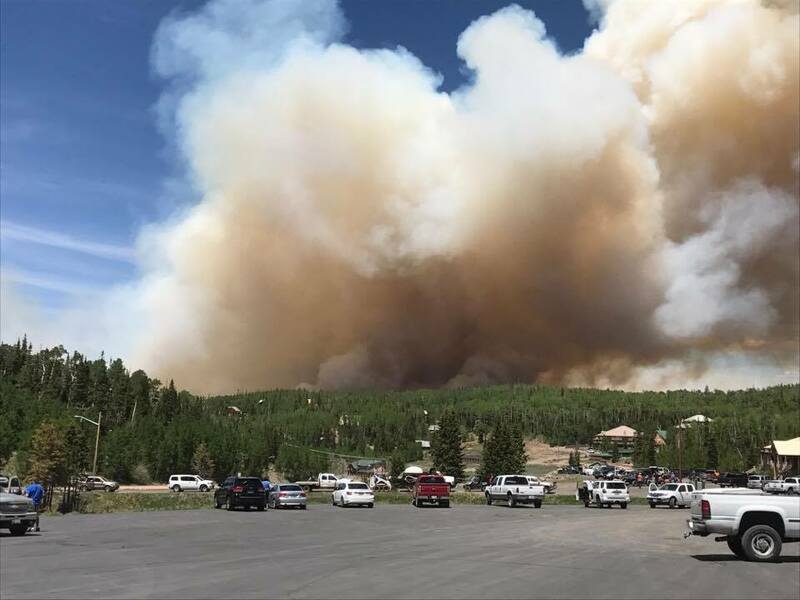 Scott Young of Washington County, who was spending the weekend at the Brian Head Resort, said his group started to see smoke from where they were outside of town and drove into Brian Head to see what was going on. 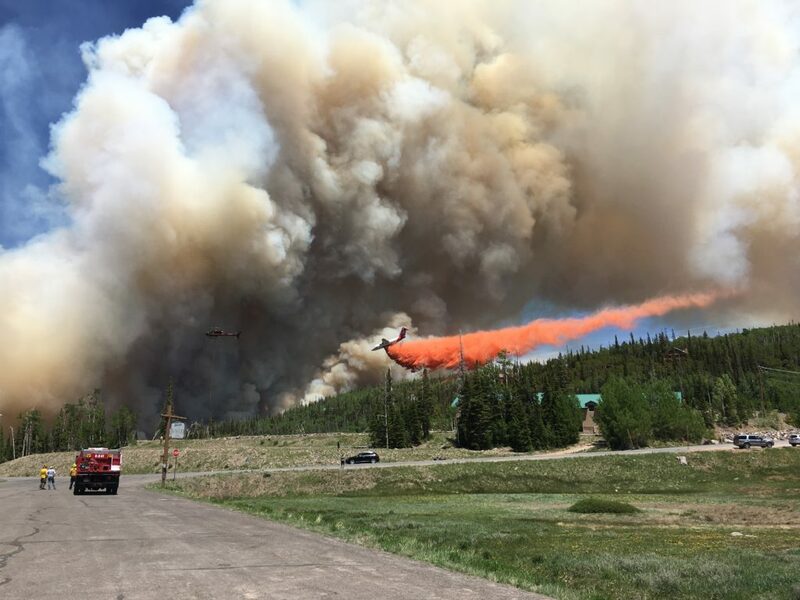 By the time they got there, they began to see flames near the town and noticed how much larger the fire appeared from when they had just seen the smoke. Young’s group was about 100 yards away from the flames at one point and “could feel the heat,” he said. 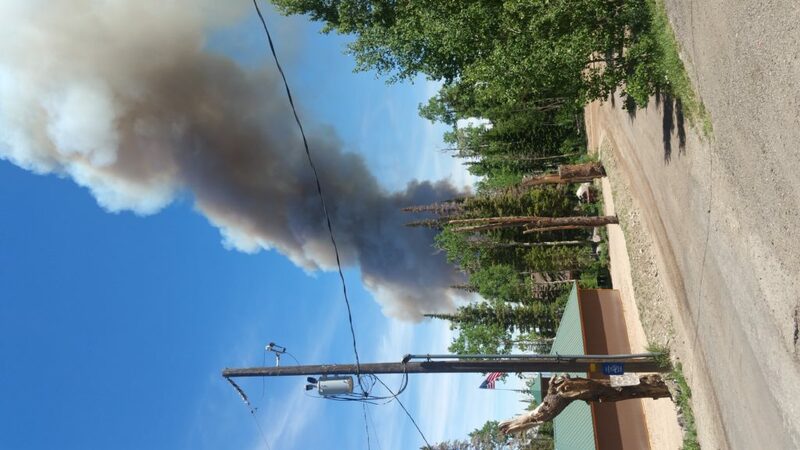 They left the town soon after and relocated to the other side of a hill from Brian Head, Young said. 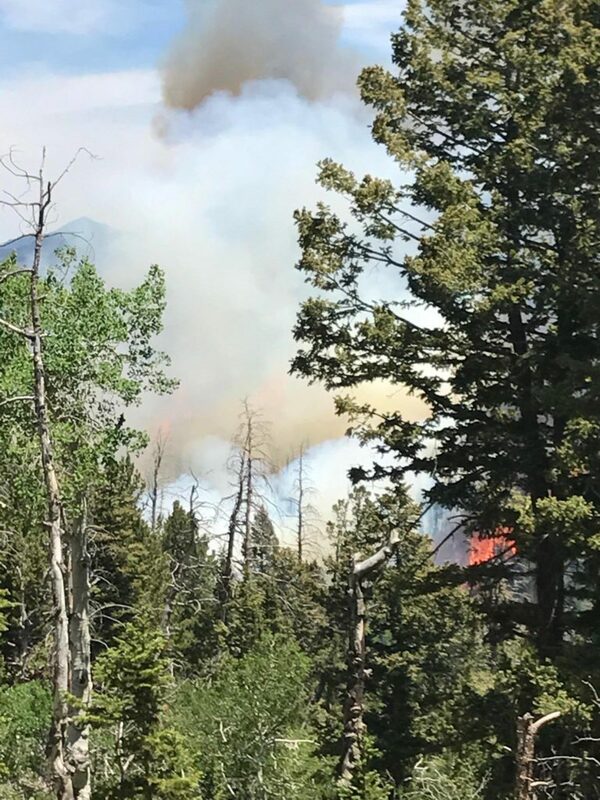 The wildfire initially triggered the evacuations of the Circle and Half Circle Drive neighborhood as well as Lee, Rue Jolley, Aoki Michi, Forest, Falcon, Elk, Mountain View and all adjoining streets in the Forest Drive area as far south as Steam Engine Drive, according to the Brian Head Marshal’s Office earlier Saturday. 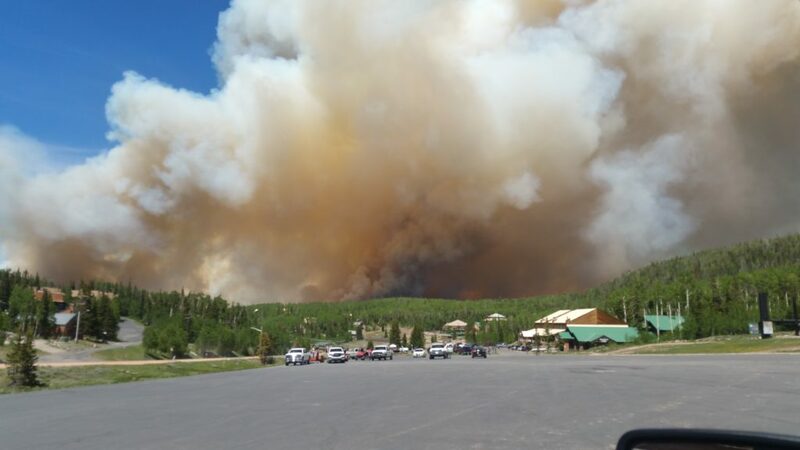 Evacuations later grew to include the entire town. 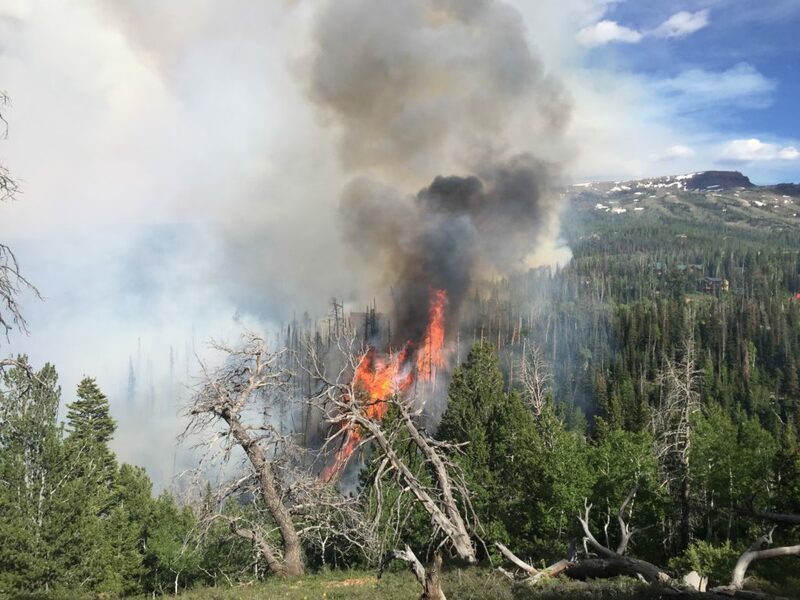 “The fire is very active,” Mike Melton, southwestern area fire management officer for the Utah Division of Forestry, Fire and State Lands Management said, adding that current conditions are also hot, dry and windy. 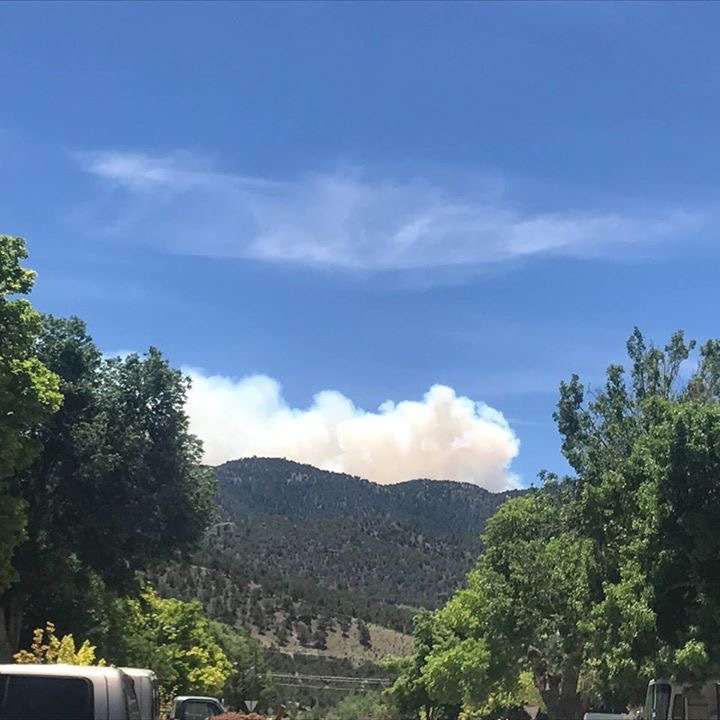 The fire is located on the north and east sides of the town with no estimated containment at this time. Man, super scary. Prayers for the fire fighters and property / business owners up there. 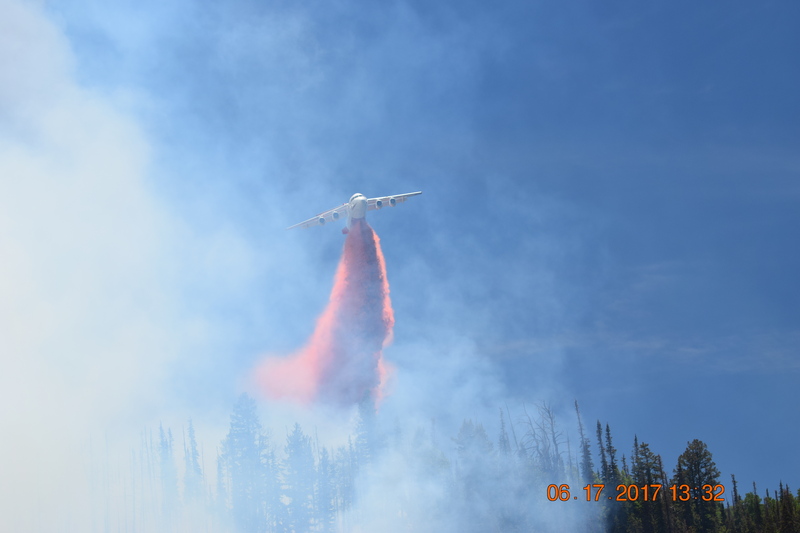 To answer the boys question from the video, the fire retardant is red so they can easily see from the air where previous passes went. This lets them better coordinate multiple runs to create a solid fire break to stop or direct the fire. It also helps them avoid dumping the very expensive (both in terms of money and time) retardant on the same place twice. There is a similar question that is often asked: Why do fire fighters wear RED suspenders? That outta teach those bark beetles! 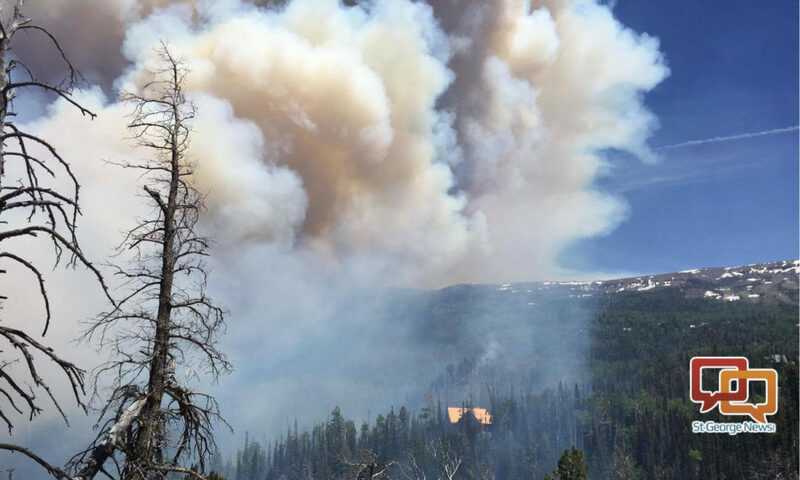 Agree – too bad the dead timber could not have been sold and the forest cleaned up …..
All cabin owners, enthusiasts, tourists, and Cedar Mountain lovers share your anxieties and fears and we want you to know we are praying for your deliverance and safety and will share in the sadness of losses.